Bali is the most popular island holiday destination in the Indonesian archipelago, with a good reason. You can experience a fine combination of sandy beaches and rolling surf, an ancient culture known for its warm hospitality, and exotic temples and palaces set against stunning natural backdrops. Travel inland and towering volcanoes and pristine jungles await with plenty to see and do, although it is difficult to stay away from the beach for long. Bali offer an endless choice of local and international cuisine and, after sunset, famous hotspots come to life offering exciting clubbing scenes and packed dance floors. This tropical gem can be best explored with Bali tour packages. Catch sunrise at Mount Batur, marvel at Uluwatu Temple for its magnificent cliff top setting, or play with the monkeys at Sacred Monkey Forest Sanctuary. SOTC can help you plan for an excellent Bali honeymoon packages. A trip to Bali is a journey through an exquisite landscape of mountains and hills that are complemented by sandy beaches as well as the stunning coastline. The place is also known for beautiful rice terraces, archaeological attractions and an amazing culture of welcoming locals. Bali tourism offers an ideal setting for a romantic honeymoon amidst pristine beaches and beautiful sights. Seminyak is known as a place that is quieter and offers upscale beachside villas and resorts. Other major cities of this Indonesian province are Candidasa, Sanur, Jimbaran, Denpasar, Padang Bai, Ubud and Lovina. Bali packages include most of these places. The island gem also offers a whole bunch of natural attractions like Mount Agung and Mount Batur, as well as historical sites like Pakerisan Valley, Jatiluwih Rice Terraces and Taman Ayun Temple, which always figure in the itinerary of Bali honeymoon packages. One of the best things to do in Bali is to explore these beautiful places with your loved one. Amongst the popular places to visit in Bali are Mount Agung and Mount Batur, which is filled with crater lakes, rivers and rainforests, attracting the nature-loving honeymooners. Honeymoon in Bali is incomplete without exploring its long list of idyllic beaches like Kuta, Dreamland, Lovina, Padang Padang, Geger, Jimbaran, Seminyak and Sanur. Hindu temples of Bali are popular sights and due to a large number of such temples, it is sometimes known as the Island of a Thousand Temples. Your Bali trip is incomplete without visiting these beautiful spiritual hubs. 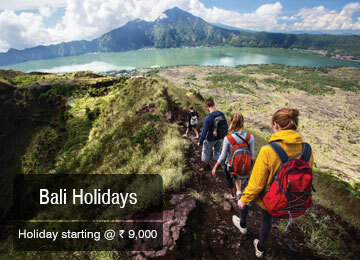 The best time to visit Bali and experience a pleasant weather is in the months of May, June, and July. Bali with its idyllic beaches, buzzing nightlife and romantic sceneries make it the best place for a honeymoon. It is no surprise that they are a regular feature on the international honeymoon packages. Seek a spiritual honeymoon at Cambodia, enjoy the serenity of the Himalayan kingdom of Bhutan or relax at the idyllic beaches of Seychelles. Speak to us at SOTC about the various destinations you can head to on your honeymoon. 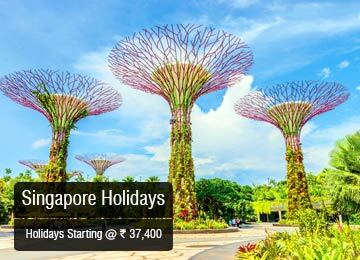 Browse through our exclusive International tour packages to explore the best places around the globe! Bali is a hot country and it is always better to carry sunscreen, umbrellas and hats, especially while visiting the various sites. If you are visiting the temples, make sure you dress appropriately. Try the Nasi goring to understand the real taste of Bali cuisine. It is better to drink bottled water, especially if you have a weak stomach.